You are viewing articles tagged obama. Folks, here’s my vision of the near future. Elections happen in November. It’s close. 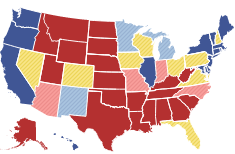 Florida ends up deciding the race again, as the NYTimes map suggests. The last poll, now a month old, had Romney ahead of Obama by 6 points. It’s no good. There’s plenty of jockeying going on, what with Romney considering Marco Rubio for his VP choice and Obama’s immigration announcement. But, same as it ever was, it’s going to come down to the economy. And the economy is looking grim. The unemployment numbers get worse with each month. Europe is about to go off a cliff. Bad stuff. My question is, what do we do about it? There are five months before the election. Most of the people reading this believe that Barack Obama needs to be president for four more years despite his legion of disappointments (highlights include the continuation of the policy of secrecy begun by GWB, the drone war, and the treatment of whistleblowers). We’re on the ground here in Florida. What can we do to persuade our fellow Floridians who voted for Obama last time but are considering voting for Romney this time that they shouldn’t? The future it is in our hands people. We need a course of action.